Tai Chi is considered a soft style martial art – an art applied with internal power, a form of moving meditation, focusing the mind solely on the movements of the form which helps to bring about a state of mental calm and clarity. 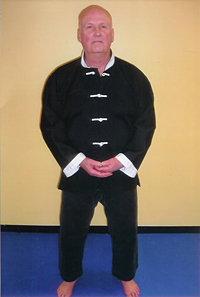 Tai Chi’s gentle, flowing moves are elegant and yet simple for anyone to learn. There are general health benefits and stress management attributed to Tai Chi training, concentrating on relieving the physical effects of stress on the body and mind. Tai Chi training involves learning forms which are an exceedingly slow sequence of repetitive movements which emphasize a straight spine, abdominal breathing and a natural range of motion. The movements help internal energy flow in a relaxing manner, improving mental and physical balance.